At first glance Pigeon Forge doesn’t appear to be a good choice if healthy eating is a must on your travel itinerary. After all, pancake houses, all-you-can-eat buffets, fast food joints and restaurants that tout their “down home cooking” line the main drag. But in this case first impressions are deceiving, as a deeper investigation reveals a number of Pigeon Forge restaurants with healthier options. With that in mind, here are a few of my top picks for healthier fare in Dolly Parton’s neck of the woods. A mainstay in Pigeon Forge, this country style cafe not only bakes their own bread and grinds their own grain, but they also and make their own plates. And after lunch I walked over to the mill, saw pottery being thrown next door, and watched the bakers craft their delicacies. Truly, this eatery is about as close to farm-to-fork as you can get. As for the food choices, well, although it was tempting to order one of the Southern specialties I managed to refrain from overindulging, and instead opted for the very tasty Chicken Almond Quiche served with fresh fruit. It was a very light quiche and the strawberries that accompanied it were about the best I’ve ever tasted. The menu also features a number of other healthy choices, such as Strawberry Spinach Salad and Grilled Sesame Chicken Salad; or you could just throw caution to the wind (as Charles did) and order the gut-busting Pimento Cheese Sandwich, accompanied by a hearty helping of fries. Truly there’s something for everyone there. As the name implies, this place specializes in beef and seafood, and from the looks of it they do both equally well. I’m not a beef eater, but there are plenty of healthy choices on the seafood menu. I was pleased that a good chunk of their entrees are grilled instead of fried, and they also have an impressive selection of salads. In the end I chose the Cilantro Lime Grilled Shrimp which was delicious. It was served up with some tasty wild rice pilaf and a healthy serving of steamed broccoli. There were a number of other healthy seafood choices on the menu, including Grilled Atlantic Salmon in Mustard Dill Sauce, and Seared Ahi Tuna. Carnivores won’t be disappointed either, as the menu offers a large selection of grilled steaks. 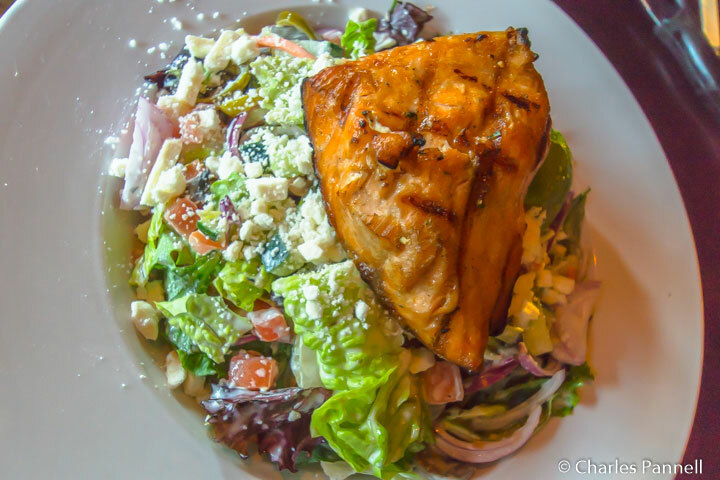 And Charles — most likely regretting his heavy lunch choice — went with a very fresh looking Salmon and Avocado Salad. No foodie roundup of Pigeon Forge would be complete without a mention of The Old Mill Restaurant. 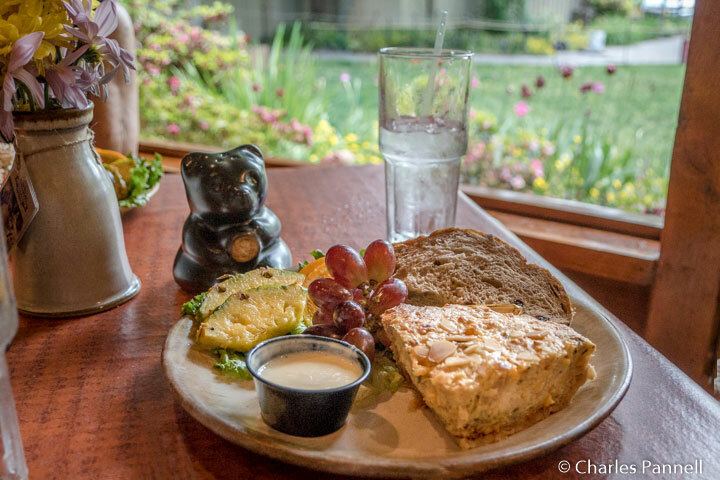 Located down the road from Pottery House Cafe and Grill, this Pigeon Forge icon overlooks the Pigeon River; and even though they serve up some hearty country fare, healthier options are also available. 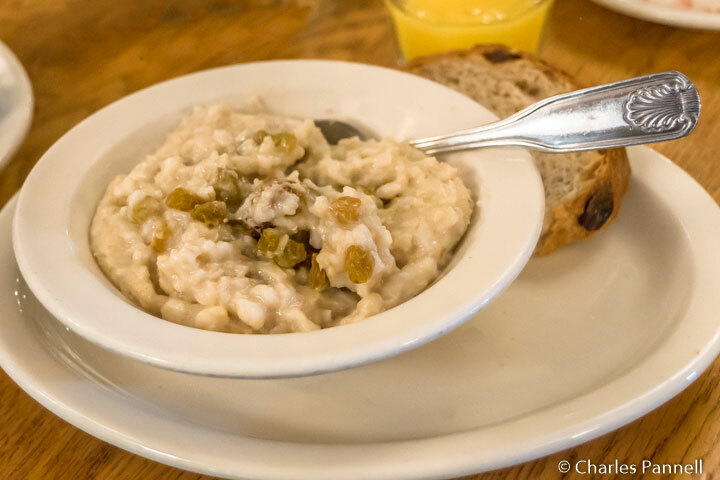 Again, it’s all about choices at The Old Mill Restaurant, as you’ll need to steer clear of the hearty country breakfast as well as the biscuits and gravy. The steel cut oatmeal is delicious, and it’s a very healthy choice, even if there is enough for two servings in one bowl. If you have a friend to share it, even better. And since I managed to eat relatively healthy during my Pigeon Forge stay, I figured it was time for a treat, so I split a piece of yummy pecan pie with Charles. I’m told it’s a Pigeon Forge breakfast tradition, and who am I to buck tradition? And since they serve over 700 slices a day, they are obviously doing something right. All in all my foodie excursion to Pigeon Forge was a rip-roaring success, proving once again that there are healthy choices out there, no matter where you roam. Sometimes they are bit harder to find than others, but they are there! And as an added bonus, all of the restaurants mentioned above also have good wheelchair access. Editor’s Note: All restaurants mentioned in this article were undamaged by the 2016 fires, and they are all open for business.